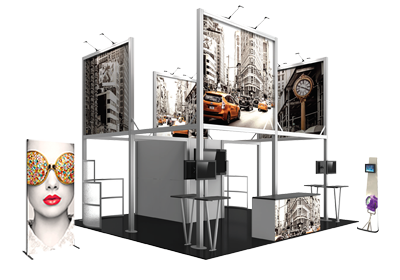 Hopup™ 7.5ft (3 quad x 4 quad) curved extra tall pop up display measures nearly 10ft tall, creating a portable display with extra space for messaging and branding. Graphics come pre-attached to the lightweight aluminum frame, and are available with or without endcaps. Assembly is easy - simply expand the frame in seconds for an extra tall display with no tools required. A wheeled carry bag simplifies shipping and transportation.